DONOR CAR: 2003 HONDA CIVIC HYBRID. ENGINE: 1.3L HYBRID 4 CYLINDER. We are not responsible for incompatible parts from model to model or year to year. Model Civic. Style Hybrid 4dr Sedan. Fuel Hybrid. Make Honda. Model Year 2003. Overall Width 68 in. Wheelbase 103 in. Wheelsize R14 in. Honda Civic Sedan GLOVE BOX COMPARTMENT OEM 2001 2002 2003 2004 2005. Condition is Used. Shipped with USPS Retail Ground. Off a - 2001 honda civic. may possibly fit other makes models years 1998 98 1999 99 2000 00 2001 01 2002 02 2003 03 2004 04 2005 05 2dr 2 dr 2 door 4dr 4 door. 01-05 Honda CIVIC SEDAN or Coupe black glove box with mounting screws. This part was removed from a 2001 Honda Civic Coupe. The car was retired due to a right front accident. This part is used and unless specifically stated, has not been tested. This item was professionally removed and given a cursory visual inspection before being photographed and listed and may have undetected flaws. MODEL : CIVIC. THIS ITEM WAS REMOVED FROM A 2002 HONDA CIVIC 4-DOOR LX SIDE SRS ; KA 4AT. Both lower tabs have a crack present, as shown. This glovebox is still in working order and the surface finish is in good condition. Glove Box Door Stopper Arms. 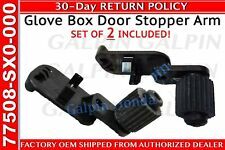 GENUINE FACTORY OEM Glove Box Door Stopper Arm FOR HONDA & ACURA. Quantity 2 INCLUDED! Glove box requires two . 2 Included in this deal. Glove box requires two. Honda - Acura. PLEASE VERIFY COLOR BEFORE ORDERING. Part/Notes: GLOVE BOX LID, GREY - Scratches. -Life is life and issues arise; people make mistakes. 01 02 03 04 05 HONDA CIVIC GLOVE BOX OEM. For your consideration is a Honda Civic SI Glove Box Latch assembly in Graphite Black. Model Year Fit: 2002-2005 Honda Civic SI 3-Door Hatchback. 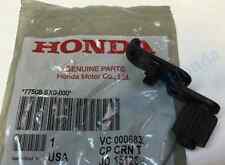 Honda Part Number: 77540-S6A-003ZB. 01-05 CIVIC GLOVE BOX. Off of a 04 CIVIC LX 4DR. 01-05 CIVIC. No labor warranty is provided. LKQ SKU: LKQ720 ~199894885 GLB05008Z. We do our best to prevent these issues from happening and apologize for any inconvenience it may cause. Honda Civic 2001-2005 (Sedan) Glove Box, Gray. 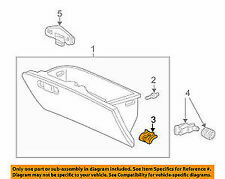 Honda Civic 2004-2005 (HYBRID) Glove Box, Gray. Very good condition used glovebox latch for 2002-2005 Civic Hatchback vehicles. Other parts for this Unit. Fits these units. Shows normal wear. 2001-2005 Civic - sedan. We do not provide product liability coverage and a professional technican should always be used to evaluate and safely instal any vehicle parts. Air Cleaner Boxes. See photos for condition. It is gray and is in good condition. SHOULD fit 01-05 honda civic EXCEPT Si model. . Truly Affordable Sales Automation. Part/Notes: MX HYBRID GLOVE BOX GREY. -Life is life and issues arise; people make mistakes. HONDA CIVIC HYBRID. REMOVED FROM 2002 HONDA CIVIC. GLOVE BOX LATCH-HANDLE. GOOD WORKING CONDITION. 01-05 CIVIC GLOVE BOX. Off of a 01 CIVIC EX 2DR. 01-05 CIVIC. No labor warranty is provided. 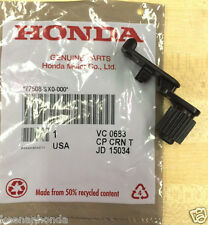 NEW GENUINEOEM HONDA / Acura ,Arm, Glove Box Stopper. ThisGlove Box Stopper f its the following vehicles This is a genuine Honda part. 2001-2005 -Honda Civic. 1997-2006 - Honda CR-V. 2003-2004 Acura RL. GENUINE HONDA OEM GLOVE BOX STAY HINGE. 2001 HONDA CIVIC 4D AUTOMATIC. THIS PART FITS ALL 01-05 CIVIC. 2003 BEETLE 2.0L MANUAL TRANSMISSION COLOR YELLOW. USED PARTS FOR 1991-1995 ACURA LEGEND. WE ARE A 1991-1995 ACURA LEGEND USED PARTS SPECIALIST PLUS OTHER CARS.